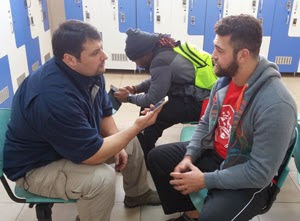 Oktay Cavus: Erik, how did you get into the AFWB program? Erik Lorig: A couple of guys who co-found the AFWB were friends of mine, that I knew just from football. And they, you know I’d heard of them, kind of watch them the last two years. I kind a see them growing. So, I got in touch with Gary Barnidge, one of the founders, maybe a month, two months ago. And I said “Hey, if there was an extra spot, or if someone cancels the last minute I’d be really interested to go on to the trip, work the camps and you know spread the football to whatever country you guys are going onto next.” It just worked out and I got on the trip, sort of last minute and now I’m in Turkey. O.C. : And thanks for being in Turkey. It’s a great thing, what you’re doing over here. What are your impressions about the football program in Turkey? 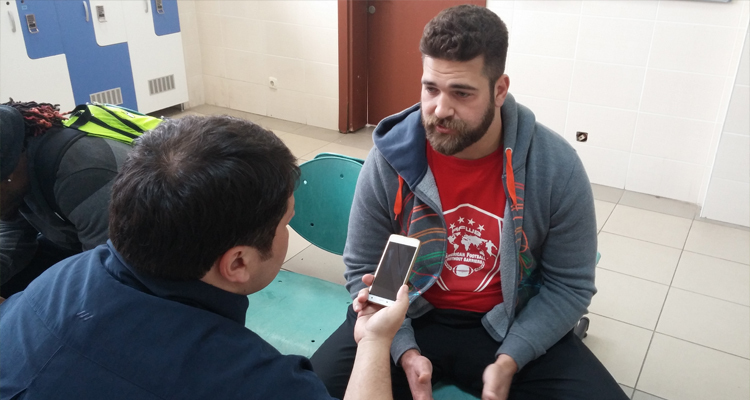 Lorig: I was very impressed and surprised. I didn’t have much expectation coming in, because I just didn’t know too much. But, since being here and working with a lot of the Turkish kids, I’d been very impressed. Because, you know, this is, I was aware of football in Europe, or Western Europe, but I wasn’t aware that it was still moving this far, south. And it has. And I was really impressed with actually the kids, who really seem to take the football like seriously. And as I’ve learned more about the Turkish culture, you know the football and the Turkish culture seem to go hand in hand, you know. A lot of honor and toughness and character. I just noticed through the kids how much they take it seriously. O.C: As a role model, to get our readers know you better; being a two way player and a versatile athlete, how did your positional shifts from DE to TE/FB affect your play? O.C. : What do you think about the football program in Tampa Bay. They had a blast in the early 2000’s. Became Super Bowl champions with Jon Gruden in 2002. And then they started to decline in power rankings again. What you think about the future of the Bucs football? Lorig: Oh I played in Tampa for four years. And I think they are a great organization. Yeah. Football is a fickle thing. It’s up and down, it’s up and down. Programs change, they go through cycles. And I think they are just going through a normal cycle. It seems they are on the up and up and making a lot of good decisions over there. Kaan Ozaydin: So, what about the New Orleans Saints, are we going to see you guys in playoffs next season? Because, you kind of missed it in a very close race, you know, last season. Lorig: Yeah, New Orleans Saints, they are a great organization. This year was, they wanted more out of this year and I think being a great organization, they are, this following year will be even better. O.C. : Do you think that the Bounty Gate hurt the defensive unit of the Saints organization? K.O. : Are you guys still talking about it in the locker room? O.C. : To take your opinion as a special teams specialist – on Green Bay’s tremendous loss to the Seahawks, on the Conference Championships – do you think the tight end Brandon Bostick was the scapegoat, for that loss? O.C. : And what you think about the evolution of the NFL football, regarding of the positions you play? Running games are not as popular, as they used to be. Many teams play with different formations where there is a restricted, if any role for the TE and, or the FB? Lorig: I think you are right. You guys are right. They’ll continue to evolve football, you know, if you’ve watched it in… Follow football for a long time, especially in the NFL, where you know, football’s, you know, the most concentrated, I mean the amount of talent and everything that is changing… Football is constatntly changing and evolving. And that goes with the positions, too. You can see that reflected in contracts. You can see that reflected in the running game, or the FBs. You always see different trends, you know. The Spread offense is quite popular right now, you know, Chip Kelly. And you’ll see that just will continue to change. Maybe that, maybe that might not be popular in five years. Maybe, they’ll go back to more traditional, classical run style, which some teams still do now. You know, the power, weak side, iso… You just don’t know. But, I think, the one thing that is true is the football is constantly evolving. Every year it changes.